조선 후기 중국의 요동 지방에서 북경 근처의 계(薊) 지역에 이르기까지의 성책(城柵), 장성(長城) 등의 상황을 그린 관방지도(關防地圖)이다. 1706년(숙종 32)에 이이명(李頤命, 1658~1722)이 제작하여 왕에게 올린 것으로, 관방지도의 백미로 꼽힌다. 1705년 청나라에 사행(使行)을 다녀온 이이명은 사행 과정에서 구입한 명나라의 선극근(仙克謹)의『주승필람(籌勝必覽)』, 청대(淸代)에 만들어진『성경지(盛京志)』의「오라지방도(烏喇地方圖)」, 조선의「항해공로도(航海貢路圖)」와「서북강해변계도(西北江海邊界圖)」, 그리고 사행 과정에서 화사(畵師)를 시켜 모사한 ‘산동해방지도(山東海防地圖)’ 등을 참고하여 이 지도를 제작하였다. 이 지도는 어람용(御覽用)으로 비단에 그려졌고 10폭의 병풍으로 제작되었다. 대폭의 화면에 펼쳐진 치밀한 구성력과 강직하면서도 세련된 필묘(筆妙), 청록산수기법으로 표현된 산악의 장식적 효과는 지도에 예술성을 더해준다. 지도사적인 가치뿐만 아니라 회화성도 뛰어난 작품이다. This remarkable map, mounted on a ten-panel screen, depicts the broad region stretching from Korean-Chinese borders to Liaodong Peninsula and Beijing. The map was made under royal orders by Yi I-myeong (1658-1722), then Minister of Defense, in 1706 (the 32nd year of King Sukjong’s reign). Liaoji, or Yogye in Korean, refers to the region from Liaodong to Beijing. The map focuses on the region’s geography with military significance. 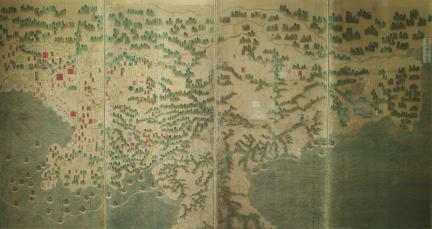 Yi made the Map by incorporating a Chinese map contained in the Ming Dynasty gazette Chousheng bilan, (Juseung pillam in Korean), which he had brought back from a trip as a royal emissary to Qing in 1705; a maritime defense map of the Shandong region, which he had an accompanying painter copy during the trip; and a Korean Frontier Map. This map is not only valuable for the study of cartographic history but also remarkable for its unusual painterly quality. It displays notable painting skills through careful composition, straightforward but refined brush technique, and ornamental effects of mountains rendered in the blue-green landscape style.